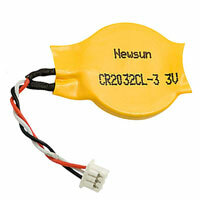 Newsun CR2032CL-3 CMOS Battery. For: Acer Revo R3610, Acer Aspire L320, Acer Aspire L3600. Acer Aspire L320, Acer Aspire L3600. Type: Lithium Manganese Dioxide. Voltage: 3.0V. Capacity: 220 mAh. Flex: Three wires of length 60 mm. Height: 3.2 mm. Diameter: 20 mm. Price: £11.99 each. Postage and packing included. Functional replacement for: part number: CR2032CL-3 and part number: CR2032CL-58. and several other laptop computers which use a 3.0 Volt clock battery. CMOS & Clock Backup batteries perform an important function when the power is turned off; the CMOS battery maintains the time and date, thus insuring their accuracy when the system is once again restarted. Also important, the battery saves the computer's BIOS set-up configuration, so the system can be efficiently rebooted once it is switched on again. For example, the computer knows what type of hard drive it is booting from etc. These batteries are variously known as CMOS batteries, Real Time Clock (RTC) batteries, PRAM batteries or simply internal batteries.